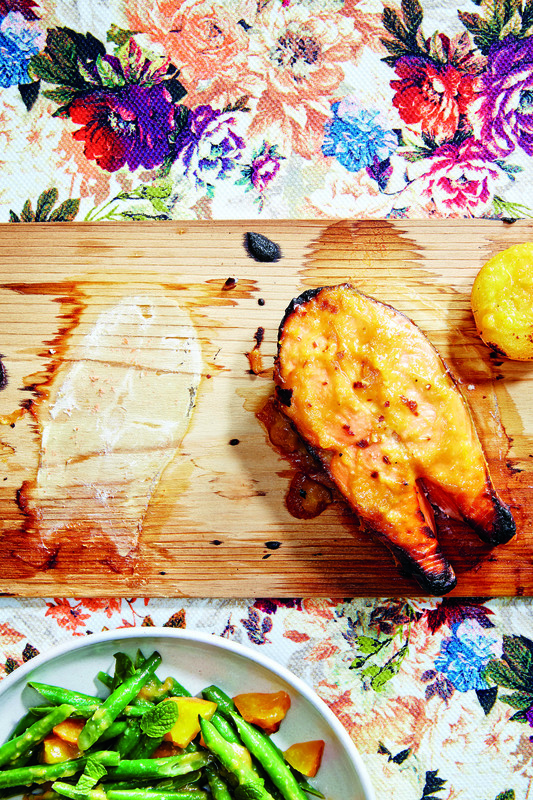 The beauty of cooking salmon on cedar planks (available at most high-end grocers) is that it’s amazingly easy, the wood imparts subtle smoky flavor, and it looks downright gourmet. To do it right, you’ll need two cedar planks, soaked in advance, so plan accordingly. Soak 2 cedar planks in water for 4 hours or overnight in a half-sheet pan or other rimmed roasting pan. Preheat oven to 500°F. In a blender or food processor, combine 2 apricot halves (or 1 peach half), the miso, mustard, apricot preserves, ginger, garlic, orange zest and juice, lemon juice, and red pepper flakes and blend until smooth. In a large pot of boiling water, cook the green beans for 2 minutes, then immediately chill in a bowl of ice water. Drain and place in a large bowl. Toss with 6 tablespoons of the blended apricot glaze and the olive oil. Reserve. Put the soaked cedar planks on a baking sheet in the oven for 5 minutes. Remove the planks and pan from the oven. Remove the planks from the pan and quickly divide the salmon and the remaining stone fruit halves, cut sides up, onto the planks. Slather the salmon and apricots generously with the remaining glaze, place the planks directly on the oven rack, and roast 12 to 16 minutes, depending on the salmon’s thickness, until it’s just cooked through and the apricots are soft. Divide the green beans among 4 plates. Coarsely chop the roasted apricots and sprinkle them over the beans, top with a piece of salmon, sprinkle with torn mint leaves, and serve.